I am continuing my commentary of the excellent Cambridge Companion to the Stoics, of which I have published a number of installments already (e.g., here, here, here, here, and here). I’ve got to the chapter by R.J. Hankinson, on “Stoicism and medicine.” And no, this isn’t going to be a post directing you to use some kind of Greco-Roman “alternative” treatments for your cold. Hankinson begins by noting that some ancient philosophers were actively interested in medicine (e.g., Sextus Empiricus), and vice versa a number of physicians had interesting things to say about philosophy (most obviously Galen). More broadly, their discussions really went to the core of the issue of the nature of science and the limits of epistemology — in many ways a very modern issue. One big debate at the time concerned the location of the “soul,” or more specifically of the reasoning function. Setting aside the obviously non-materialistic take of Plato, Aristotle suggested that sensation and thought were located in the heart, a position later endorsed by the Stoics. Yes, I know, this sounds ridiculous, but early anatomical research had clearly shown the heart to be an important center of the body, from which all sorts of major and minor ramifications spread throughout the organism, so the heart-centered hypothesis wasn’t that crazy (and it was based on empirical studies, unlike Plato’s metaphysics). However, already Alcmaeon of Croton (~480BCE) had identified the brain as the organ of reason, and shortly thereafter other authors also considered it the location of pleasure and emotion. Part of the confusion, and of the reason why the Stoics initially sided with the heart theory, was that Praxagoras thought that the nerves were the end-points of the arteries. However, soon Herophilus not only differentiated the nervous systems from other structures, but was even able to distinguish between motor and sensory nerves. Chrysippus, the third head of the Stoa, either did not know of Herophilus’ work, or did not think it valid, which is why he sided with the heart theory, earning Galen’s scorn. I find Hankinson’s discussion of causality and determinism in this chapter particularly interesting. Here Galen and Chrysippus find themselves roughly on the same side, and against non-Stoic authors like Alexander of Aphrodisias. I think this is a pretty darn sophisticated account of compatibilism. I’m equally confident that it will leave incompatibilists unmoved, just as it did in the time of Chrysippus. The broader discourse, however, as I mentioned at the beginning, was about the limits of epistemology and the nature of science. Here Galen strikes a better compromise than the Stoics: he maintained that no physician could be good at medicine if he didn’t take into account philosophy (in this he was reacting to a group of empiricists who wanted nothing to do with metaphysics); but he also faulted the Stoics, among others, for not paying sufficient attention to the empirical advances being made by the science of anatomy even at the time. Later Stoics agreed, and ended up belatedly endorsing the brain theory of thought over the now increasingly untenable heart theory. This entry was posted in Ancient Stoicism, Science on January 9, 2016 by Massimo. So even in those days, physicians were stubbornly conservative despite evidence in plain sight. To this, I refer to the story of Semmelweis, who was ignored for his work on infection, despite mounting evidence, and who ultimately was confined to a mental institution where he died. Sadly, physicians today (I am one) hold to a highly biased and well paid for the paradigm that they practice science. We truly need to reformulate that stance to recognize how incomplete the science of medicine really is, and how much stoicism can contribute. Physicians are really still shamans, having the power of placebo entrusted to their stewardship (wisely or not), and also, can be in their best practice, sophisticated risk consultants for healthy behaviors and practices. 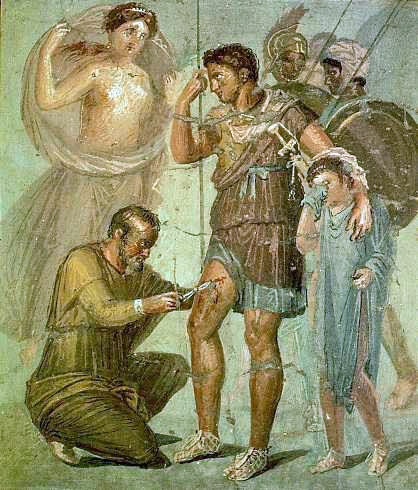 So, for example, a good physician can inspire health-giving hope into any biological reality, by using stoic principles to connect to their patient and together confront the exigency of the situation at hand. Additionally, physicians can spell out for patients exactly how much of the treatment plan they propose is based on solid (5 sigma) science, and how much is based on cultural values and hunches that really just reshuffle the deck (think of statins for preventive care for the simplest example). Thanks, Massimo, for this and all your other efforts to bring Stoicism to bear on modern times. I have and continue to greatly benefit from trying to apply the principles of Stoicism in my daily life. I find it very helpful personally, in my relations to others, and for dealing with things that come up in the course of my life over which I have little or no control. Most important perhaps is the new-found sense of freedom and contentment Stoic practice has helped me realize. This, after years of failed efforts to find such through formal education, religion, medication, rugged individualism, and counseling. I think this is a very narrow view of Stoicism. It smacks of the egoism of Dylan Thomas’s poem “Do Not Go Gentle Into That Good Night.” This was a poem I liked in my youth and took as heroic and inspirational advice but now find quite maudlin and a foolishly self-absorbed approach to life and its challenges, especially death. My aquaintance’s take on Stoicism likewise strikes me as youthful and unsatisfactory. What do you make of criticisms of Stoicism such as his? thanks for your comments. I’m not surprised at the sort of dismissal of Stoicism you have encountered. I’m currently reading a biography of Marcus Aurelius and the author is openly hostile to (and woefully misinformed about) Stoicism. I will write a few essays on that book soon. Lastly, let us not forget that I and a number of others are involved in updating Stoicism for contemporary times, just like Buddhism, say, has been, and keeps being updated. So certainly modern Stoics do not condone slavery or gender inequality, and they do not counsel political passivity. I start by apologizing for this offtopic, but I’ve missed the 5 days window posting for your last post. If you find this comment valuable, please move it to the right thread. I find it particularly usefull as a “dying before you die” exercise and as a reminder to value life, people and stuff before everything vanishes away. thanks for the comment and link, appreciated!